Noah Michelson, editorial director for HuffPost Queer Voices, talks to The Advocate about reclaiming the word "queer" and the importance of making a diverse online space for LGBT people to share their stories. 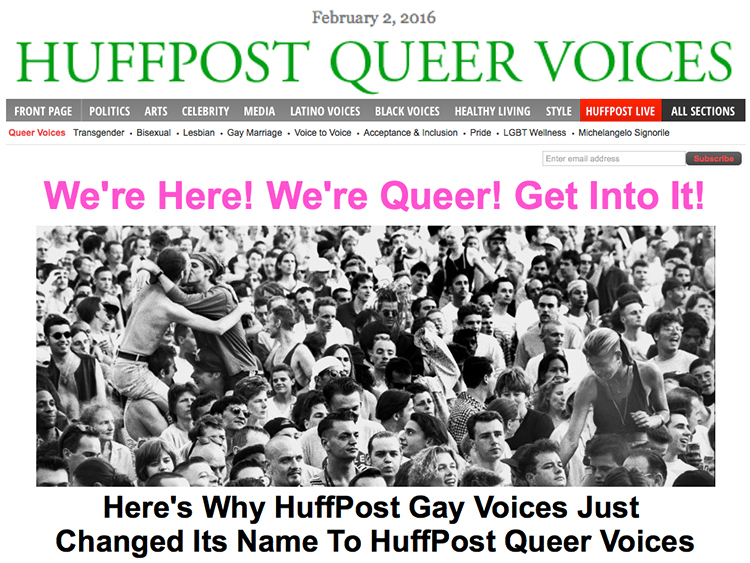 After a strategic rebranding effort, The Huffington Post debuted the latest incarnation of its popular LGBT section, aptly named HuffPost Queer Voices. According to an introductory blog post penned by HuffPo’s editorial director, Noah Michelson, the new name — which replaces HuffPost Gay Voices — was chosen in an attempt to create a more inclusive online editorial space that better represents the LGBT population at large. Historically, the term “queer” has often been used as a derogatory slur against gay men, but as Michelson points out, the word was reclaimed in recent decades as a way to identify and unify all people who fall within the LGBT spectrum. Intersectionality, especially the exploration of topics like gender, race, class, and other sexualities, will be a continued focus on the site, something Michelson notes is an exciting part of reporting about the LGBT community in this day and age. Day-to-day operations of HuffPost Queer Voices will still be run by the all-male editorial staff of Michelson (editorial director), Curtis M. Wong (senior editor), JamesMichael Nichols (deputy editor), and Michelangelo Signorile (editor-at-large), but already-established efforts to diversify the section’s roster of editors and writers will continue to be amplified so that the site is inclusive in voices and action, and not just name.